SUPPORT YOUR OVERALL WELLNESS AND TAKE HYDRATION TO THE NEXT LEVEL WITH CBDXTREME™ H2O. Water is essential to life, so get the most out of every drop with our hemp infused beverage. 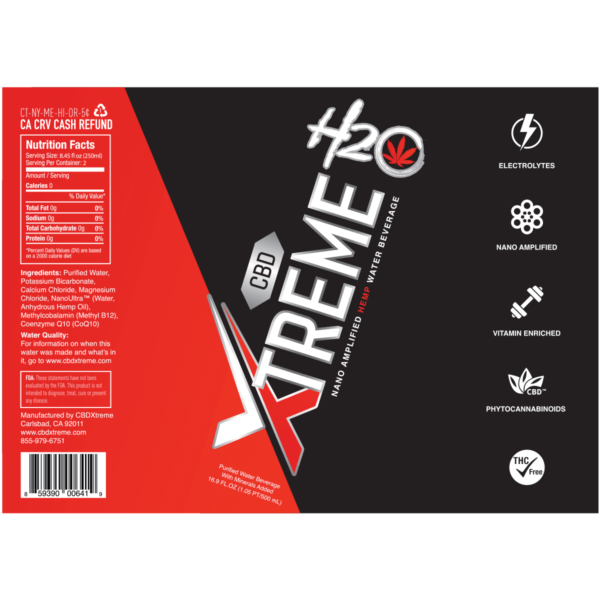 We created Xtreme Nano H2O because support for your body’s endocannabinoid system is important. 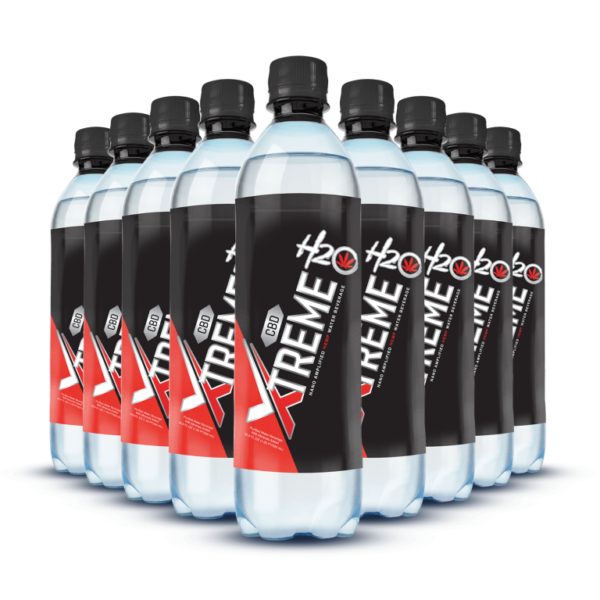 Developed by a team of doctors, the unique formulation in Xtreme™ H2O delivers hydration and cellular nutrients in the most bioavailable form possible. Our CBD water is powered by the cutting edge science of nanotechnology, our NanoUltra™ hemp oil is a water-soluble formula that provides optimum delivery of hemp’s powerful phytocannabinoids. We also add Electrolytes, Potassium, Calcium, and Magnesium. Nanoemulsified phytocannabinoids in NanoUltra™ makes the particles small enough for your cells to use exponentially more than hemp oil alone. The smaller the particle size, the easier it is for the body to absorb and eliminate. When it comes to concentration, more is not always better. Our tiny particle size yields greater surface area and higher efficacy. That means ultimate absorption and virtually NO waste with every sip of our water. 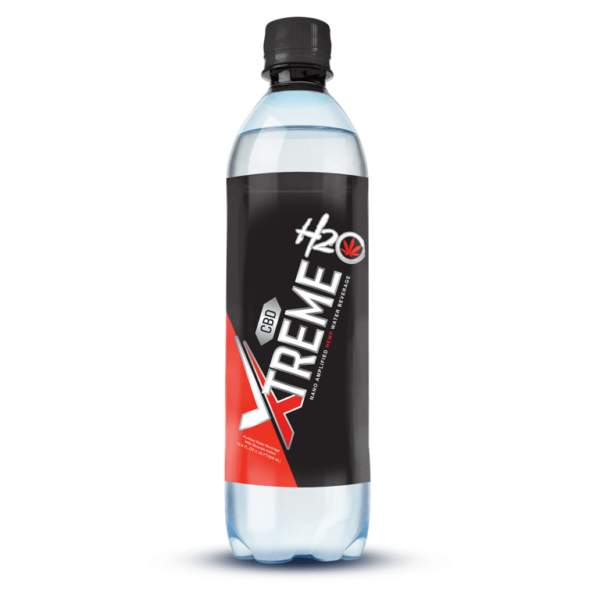 If you are looking for NON-GMO, safe, sustainable, and chemical-free hemp infused water to support your wellness goals, Xtreme™ H2O delivers the best for you. For additional cannabinoid wellness support, check out our CBDXtreme™ CHEWit Daily Gummy Chews, available in Tayberry and Acaí Blueberry, powered by Heneplex™ and loaded with extra nutritional support. How to Use – Drink as you would any bottled water. If you are suffering from an illness and/or if you are taking medication, consult your doctor before taking any supplements. Pregnant or lactating women should not take phytocannabinoids without first consulting with their doctor. Always consult your medical doctor before modifying your diet or using any new product. Each serving contains phytocannabinoids. These are all completely natural and beneficial cannabinoids found in hemp. our CBDXtreme™ H2O quenches more than just your thirst with every sip. Enjoy the benefits of optimal hydration and cellular nutrients in the most bioavailable form possible. This nano-amplified hemp-infused water beverage is powered by cutting edge science for optimal balance and wellness support. Use this versatile oil as a CBD vape juice and add straight to your tank or drip rig or mix with an e-liquid for balance and wellness. Our CBDXtreme™ ADDit TruSpectrum™ Hemp Oil brings you all of this extract’s valuable benefits to consume as you choose. Unlike isolated or synthetic CBD and other cannabinoids, our full-spectrum hemp oil delivers the range of phytocannabinoids present in the hemp plant, as nature intended. With three delicious formulas, you can vape your way to improved energy, better rest, or simple relaxation. 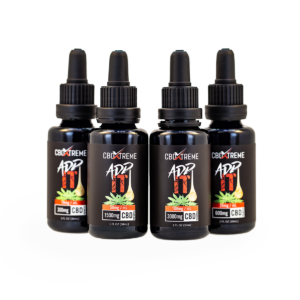 Vaping is a convenient and powerful way to boost your wellness efforts and CBDXtreme™ makes it delicious! Our VAPEit formulas combine phytocannabinoids and adaptogenic herbs in tasty blends.